A beloved former pet, Booger arrived at the PRC in October 1994 after injuring his longtime owner rather severely. 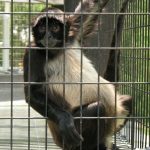 After being introduced to other spider monkeys, he flourished in the company of Bisou, Chester and Dehlia. His unforgettable personality endeared him to all who met him. Booger loved to sit in the sun and groom his buddies, run down the length of his cage to chase the golf cart, and bounce up and down on a squeaky toy while chirping and whistling for attention. His kind face was punctuated by strikingly beautiful eyes of an unusual deep grayish blue color. We were heartbroken to learn in early 2011 that he was suffering from terminal kidney failure, and our staff and volunteers spoiled him rotten during his final days. Booger will always hold a very special place in our hearts.